First Month On Us! Join now and mention The 30 Second Wine Advisor, and your first month is free. Ugni Blanc - the French version of Trebbiano that's mostly used to make Cognac - turns up occasionally in a modest white wine that can be worth a second look. This Gascon white is full of juicy, snappy citrus flavors and very tart acidity that makes it a fine food match, but it's less of a buy when the rising Euro pushes it over $10. Randy Caparoso offers a thorough tutorial on Chianti and Super Tuscans, and François Andouze talks about very old wines on our Internet radio TalkShoe. On our forums, we talk about our current wine fascinations, and poll your preferences for cork, screw cap or synthetic. Last month, when I raved about the impressive white wines of Italy's Lugana region on the south shore of Lake Garda, I mentioned that the Luganese proudly assert that the Trebbiano grape used in the local wine is, well, different from the Trebbiano that's widely grown and casually produced across most of Italy. Frankly, most Italian Trebbiano (and the identical French grape Ugni Blanc, which was most likely exported from Italy to France when the Catholic papacy moved to Avignon during the 1400s) is lightly regarded at best. Indeed, in her excellent Oxford Companion to Wine, British wine scribe Jancis Robinson asserts that the Trebbiano of Lugana (and of nearby Soave) isn't Trebbiano at all but a synonym for Verdicchio, a grape of considerably greater luster. True Trebbiano, on the other hand, is nearly ubiquitous - Robinson asserts that, when we consider all the Trebbiano and Ugni Blanc grown in Italy and France (and Argentina, which happily adopted the variety), it may be the world's most widely vinified white grape, surpassing the Spanish Airén in production if not acreage. But most of it, frankly, doesn't amount to much. Speaking of Trebbiano, Robinson says, "It is, like most copiously produced wines, low in extract and character," albeit "usefully high in acidity." Indeed, the lion's share of French Ugni Blanc is never sold at retail but used as the base wine for distillation into Cognac, the world-renowned, strong grape-based liquor of Gascony. A few Gascogne producers, however, do turn Ugni Blanc into a dry table wine, and some of those have achieved a following based on decent, drinkable quality (if not great character) at an affordable price. 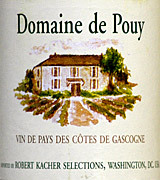 One of the best of these is Domaine de Pouy, a crisp and snappy white that blends Ugni Blanc with Colombard, another lightly regarded white variety. Producer Yves Grassa makes it primarily for U.S. sale through importer Robert Kacher. It's handled with exceptional care, cool-fermented to retain its fruit, kept three months on its yeast lees to impart complexity and never touched by oak. The 2005 vintage - now closed with a sturdy metal screw cap replacing the synthetic stopper used in recent past years - is now widely available, and the fresh new 2006 will be arriving soon. It's a fine potable for a hot summer day, with or without a meal, but as noted in my tasting report below, like all white wines it shows a bit more complexity and richness at cool cellar temperature, not ice cold. The California Wine Club: First Month On Us! Since 1990 The California Wine Club has been introducing wine enthusiasts to California's best artisan wineries. Club proprietors Bruce and Pam Boring travel wine country, searching out award-winning wines made in such limited supply they can't be found in local stores. Every wine is 100 percent guaranteed, and they are so confident you will love the club, they are willing to give you the first month on them. This $45 savings is yours just by mentioning The 30 Second Wine Advisor. Each month is $32.95 plus shipping, and includes two bottles of hand-selected, award-winning wine and the Club's fun and informative magazine, Uncorked. And if you taste something you love and want more, reorders are available with savings up to 50 percent off normal retail prices. Join the club now and experience a true California wine adventure! Call 1-800-777-4443 or visit www.cawineclub.com and be sure to mention this free month offer! FOOD MATCH: Its tart citrus flavors and sharp acidity might overpower more delicate fare, but it's fine as a counterbalance to richer poultry or fish dishes including my choice, a roast chicken infused with fresh tarragon and sauced with a tarragon-Dijon bechamel. VALUE: Long a "QPR" favorite for well under $10, it's still fair if not quite such a bargain at the $11 I've been paying locally for the past couple of years. Shopping around may pay dividends, though, as Wine-Searcher.com finds it for as little as $6 in some regions. WHEN TO DRINK: It's not meant for long-term aging, but the modern-style metal screw cap that closes the 2005 vintage will keep it longer on the screw cap than the plastic stopper used in recent editions. Note that the 2006 is already coming into the market, and should be comparable in style with the added benefit of freshness. Ugni Blanc = "Oon-yee BlahN"
Domaine de Pouy is "wine of the month" on importer Robert Kacher's Website, so you'll find an article about it at this link during May 2007. (Thereafter, try searching the Kacher site for "Pouy." Today's article is cross-posted in our Netscape WineLovers Community, where we also welcome comments and questions. When you think of Chianti, do you visualize a wicker-wrapped bottle of "spaghetti red," Hannibal Lecter's choice with liver, or, perhaps, a sleek, modern and high-fashion Italian wine? Randy Caparoso catches us up on Chianti in this latest article in his "World of Wine" series.  WineLovers Discussion Group: What's your current wine fascination? We all go through phases in our love of wine. We try a little of this and a little of that. Then along comes a magic bottle, an old friend or a new discovery that casts a spell. You start paying extra attention to this grape or growing area, and you can't get enough of it. What's your current fascination? Share it with fellow wine lovers in this long and interesting conversation on our WineLovers Discussion Group. Let's sample current opinion about the natural cork versus alternative wine closures by asking the usual question in a different way: Ignoring all other variables, if you had to choose just one type of closure, would it be natural cork, screw cap or synthetic stopper? Tell us your bottom-line preference in this week's Netscape/CompuServe Community poll!